I rarely ever do 3D nail art due to my active lifestyle, but decided to give it a shot today. 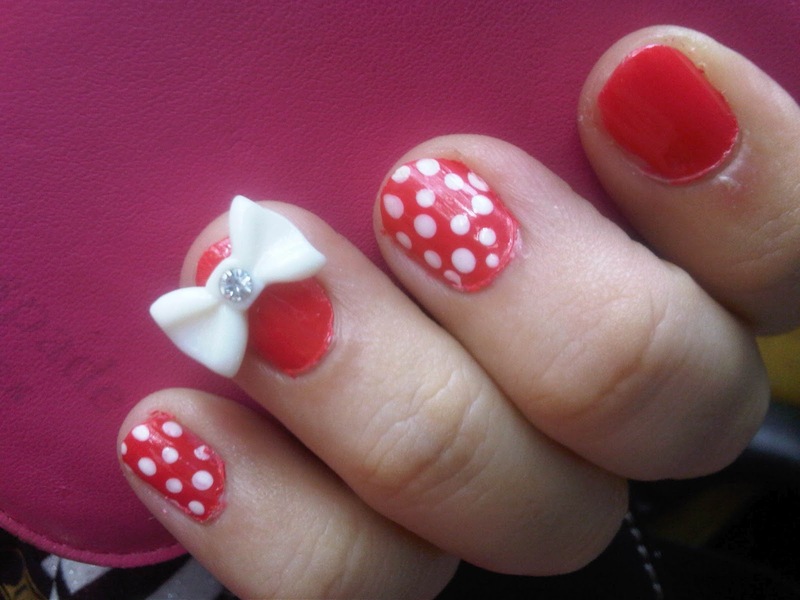 I was attending an event that had a red and white dress code, so I figured I would do a slightly Minnie Mouse-inspired manicure. I used OPI's Cajun Shrimp and Alpine Snow polishes for this manicure. I topped it off with a white 3D ribbon on my fourth finger. It took me a while to decide which finger to add the ribbon on, but I eventually decided on the ring finger so that it would not be too obstructive. It was a pretty quick and simple manicure which took me 30 minutes to complete. My nails are not too long these days for I prefer to keep them short. I wear gloves very often, so having long nails can get extremely uncomfortable and even dangerous. I never want to risk ripping my nails out by accident when it gets caught in the glove or other equipment that I handle! It's been some time since I've done fancy manicures, but I look forward to try more designs soon. Till done, it shall be Minnie Mouse nails for the next week!